Served up in a beautiful Fiesta bowl. I know they are healthy and, with rice, are supposedly a complete protein [although this article offers some interesting context to claims that plant-based foods like legumes lack the right kinds of amino acids to be considered “complete” proteins on their own]. But in reality, whether canned or dried and then home-cooked, lentils have always struck me as bland and textureless They remind me of the meals distributed at the many social-justice-oriented events I have attended over the years: morally unimpeachable and strenuously healthy–but flavourless, gas-inducing and somehow, as a result, more than a little bit soul-destroying. Nonetheless, about a year ago I stopped in at my neighbour Rhea’s house and, as usual, smelled something amazing bubbling on her stove. When I asked what it was she told me it was lentil soup. LENTIL soup, I asked? Yes, she replied, and offered to share her recipe with me. The recipe turned out to be from a cookbook (unfortunately I have only an image of the recipe itself; I’ll add the title as soon as I get it from her) she had bought remaindered at Book City. Rhea is not only an incredible cook; she also has a genius for identifying promising remaindered cookbooks, and I have come to trust her recommendations absolutely. Beautiful vintage enameled cast iron Descoware (Belgium) dutch oven. I bought this from another neighbour for five bucks! And so, unusually for me, every month or two I feel what for me is a very strange craving for lentils, and make a variation of the following recipe. It is adapted considerably from the instructions in Rhea’s cookbook, and could be altered even more to suit personal taste (I don’t use chiles in my version because I have a limited capacity to handle heat; perhaps in response, my husband almost invariably adds some sriracha sauce to his bowl). 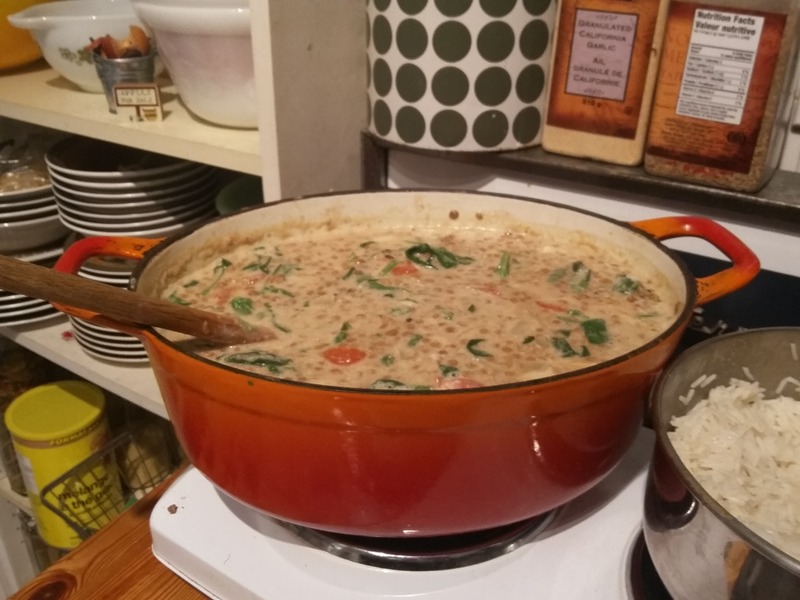 My version makes a large vat, suitable for several days of leftovers (like most stews, the flavours get richer over a day or two) or freezing. It is great with basmati rice or hearty bread. This is a great winter dish because it is so hearty; for a lighter summer offering, one could omit the cream and yoghurt. As a note: in my view cardamom is the winning ingredient in this dish. Black or brown cardamom has a rich and smoky taste that adds quite a lot of depth to the dish. Buy it whole to preserve its freshness, crack it open and grind the seeds (discard husk) as needed in a mortar and pestle. Enjoy! 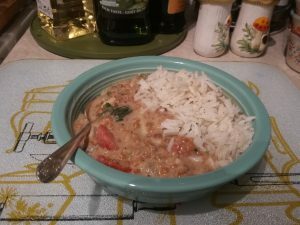 I’d love to hear about your variations on lentil dishes! When lentils are cooked and the stew seems 'ready,' add tomatoes and torn spinach and reduce heat.